“You have to do this as if you wanted to waste your time, but waste your time efficiently" (Feldenkrais, rg94, p. 149).”I have often been asked how do you use the Smartroller tools. Lately I am reminded of this concept and have tried to act on it with playing with the Smartroller tools to inspire new ideas and kinesthetic inquiry. I hope they inspire you. Today we’d like to introduce you to Susan Bass. My business partner, Stacy Barrows and I worked part-time as independent contractors in a well respected orthopedic practice. Due to a multitude of factors, the corporation broke up and we were offered the physical therapy practice including the equipment. Within one months time, with no prior business experience or knowledge of how to operate a practice, we rented space in the existing medical building and started Century City Physical Therapy Inc. (CCPT) With no initial capital structure nor financial backing, Stacy and I were required to see patients outside the practice to help subsidize our new endeavor. Neither of us were able to withdraw any income from the practice for the first 6 months and had no support staff. Within 1 year we were able to hire our first employee and work solely at CCPT. Our phenomenal culture of high-quality evidence-based care incorporating wellness with rehabilitation in an intimate patient-focused environment has sustained us for 23 years. Besides traditional physical therapy, we also offer complementary healthcare such as pilates, Feldenkrais®, and personal training. Read more here! This has been an exciting week with the Feldenkrais Awareness Summit through Future Life Now. I had the pleasure to speak to teachers around the world, trained in Feldenkrais, Yoga, Pilates, Personal Training and more. I am posting the standing roll down lesson I created to access imagery for core coordination with a Feldenkrais lens of awareness. Enjoy. Please post comments on your experience. Thank you. Start with a check in. Notice how you are standing and the support from the ground. 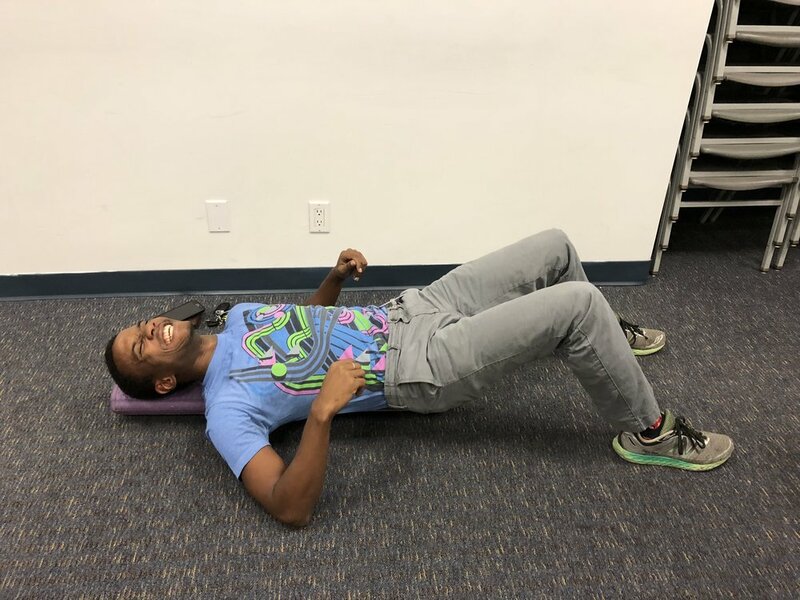 Slowly lift one arm and then the other so you can sense the connection to your spine, legs, feet, lower abdomen, shoulders and breath. Walk over to the wall. Gently lean your back into the wall, without pushing into it. Walk your feet out about one foot away and allow your feet to be under your hip joints. Notice the contact of your back to the wall. Notice your breath. Sense the ground support. Without moving, how far away is your head from the wall. Slowly take your head back to make light contact and notice where you touch and the actual distance. Then return your head to your starting position. Slowly shrug your shoulders and lower them down with gravity to notice their location on your body. Slide your right hand down your right leg, allowing your spine to curl in that direction. Notice your ease and how your spine segments adapt to the movement, then return. Slide your left arm down your left leg to notice how the two sides compare. Pause in the middle. Gently slide down the wall, bending your knees and ankles. Only go as far as you can do it to sense a fuller contact of your back to the wall and not to overly engage your legs. This is not a wall slide exercise. Pause in this position and make sure you take plenty of rests as you need to by sliding back up the wall. Gently roll your pelvis under and then slightly arched, as if you are doing 12-6 with the pelvic clock on the wall. Sense how you do this. Can you soften your belly to make the movement fluid and easy? Which way is easier? Rest and slide back up the wall. Slide back down the wall as before, and pause. This time start to roll out the spine by moving your pelvis away from the wall, detaching your spine, segment by segment. Then return to the wall, noticing how you reverse the movement. Do this a few times, noticing your breath, weight shift through your feet, how your eyes participate and how this effects the way your arms hang down. Rest, by sliding back up the wall. Slide down again and pause in the same position. Rest your hands on your thighs and gently slide both hands down towards your feet. Don’t go very far, just enough to sense your spinal chain movement and repeat this a few times, reversing the movement back to your start position. Pause. Do the same movement, but this time put both hands on your right thigh and slide them down on the right side. Repeat this a few times. Try this on your left side. How do they compare? Rest back up with your legs long.